Gluten-Free Double Fudge Cookies are a perfect answer to the problem of making brownie-like cookies without gluten and without (dare we say it?) fat. How can that be, you may wonder? Even better about this recipe is that it’s got two kinds of chocolate. Cocoa and chocolate chunks combine to make a dense cookie that tastes a lot like a brownie. The result is a fudgey, deep chocolate flavor but without a heavy texture. By dropping them in double scoops, you can make jumbo cookies. To bring eggs to room temperature, set them for 30-45 minutes prior to making cookies. Preheat oven to 350º F. Line baking sheets with parchment paper. Spray the parchment paper lightly with cooking spray. With a measuring tablespoon, drop 2 rounded spoonfuls per cookie onto the prepared baking sheet – six cookies to a tray. Cookies will spread in the oven. When baked, they will be 4-6 inches across. Bake 12-17 minutes until the tops of the cookies are glossy and lightly cracked. Remove the baking sheets from the oven. Allow cookies to sit for 2-3 minutes before using a spatula to slip them off the parchment paper and transfer them to a wire rack. Let cookies cool completely. Do not overbeat the batter or the cookies’ texture will become like meringues. Mound dough as you drop it onto baking sheets. The cookies will spread plenty. Use several baking sheets. 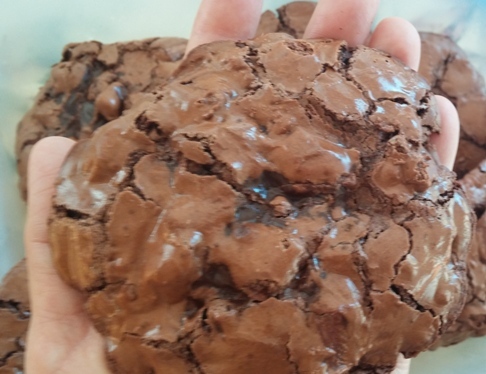 Because of their size, you can only bake six Gluten-Free Double Fudge Cookies per sheet. Also, these cookies take longer to bake than most drop cookies and longer than most to become firm. By using several cookies sheets, you can rotate batches of cookies in and out of the oven without wasting oven heat and baking time.